There are few topics in the social sciences that create more confusion among the public than divorce. The conversation usually begins like this... "If half of all marriages fail how can your survey find that only 12% of Catholics are divorced?" The root of this problem is that there are so many ways divorce and "divorce rates" are measured, calculated, and discussed (...not to mention that the "half of all marriages" notion borders on urban legend status). The U.S. National Vital Statistics System measures a crude rate. This is simply the total number of divorces in a year per 1,000 of the population. Using this measure one can conclude that divorce is becoming less common in the United States. In 2011, there were 877,000 new divorces or 3.6 per 1,000 of the U.S. population. In the 1980s this measure peaked above 5 per 1,000. The primary reason this number has declined is because fewer are marrying in the first place. The crude marriage rate in 2011 was 6.8 new marriages per 1,000 of the U.S. population. Just a dozen years ago this figure was above 8 per 1,000. In a longer view, it is important to remember that in the 1970s nearly three-quarters of the adult population was married. In 2012, only 52% of U.S. adults were married. The easiest (and certainly not the best) way to measure "divorce odds" is to divide the crude divorce rate by the crude marriage rate (e.g., 3.6 / 6.8). Using this simple method one could estimate that "53% of U.S. marriages end in divorce" with the most recent data. However, this is quite unrealistic and sloppy as the number of marriages and divorces in any single year are for the most part unrelated (with the exception of those who divorce only a few months after marrying). To more accurately measure divorce odds one would need a longitudinal study involving a nationally representative panel of married couples followed over many decades. That takes time and money and many prefer the quick and the crude way of measuring divorce odds (...not to mention that a longitudinal study provides results that are likely to be dated by the time the project ends). One other figure often used in the discussion of divorce is the percentage of Americans who have ever divorced. This is different from the percentage who are currently divorced as many who go through divorce remarry later in life. As shown in the figure below (using decade aggregated data from the General Social Survey 1972-78, 1980-89, 1990-98, 2000-08, 2010-12), the percentage of Americans ever experiencing divorce rose in the 1980s and 1990s but has remained more stable since then. Differences between religious affiliation groups are small. About one in five Catholic adults have experienced divorce in their lifetimes (this is consistent with CARA's recent research on the topic) and about one in ten currently describe their marital status as divorced in surveys (i.e., some remarry after divorce with or without annulment. More on this below...). The problem with this measure is that again it does not account for changes in the number of Americans marrying. Without marriage you won't ever get divorced! The second figure below, using GSS data again, estimates the percentage of Americans who have ever married that experience a divorce. This is still just a series of snapshots and not the longitudinal panel one would prefer but it does provide the most accessible view of something close to "odds of divorce." It still does not provide us with "the percentage of marriages that end in divorce" as the unit analysis is the individual and not the marriage (e.g., someone could be widowed, marry again, divorce, and marry again...). Currently, using the last two waves of the GSS for 2010 and 2012, this measure of divorce stands at 36% for the adult ever-married population. Adult Catholics stand out with only 28% of the ever-married having divorced at some point (...struggling most with "being faithful." A previous post examines religious affiliation and infidelity). By comparison, 42% of American adults without a religious affiliation (i.e., "Nones") who have married have divorced at some point. 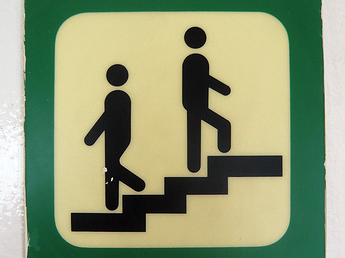 Notice the difference between the two preceding figures. 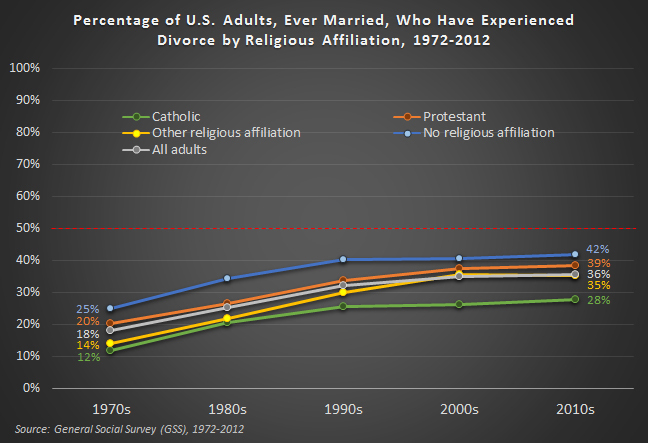 Those with no religious affiliation are among the least likely to ever divorce in the overall adult population. Yet those with no affiliation are also among the least likely to marry in the first place and once one isolates those in this group who have married, the data take on a much more dismal outlook. There are a few other religious wrinkles to examine. It takes two to marry and there is evidence that more Americans are marrying someone who does not share their faith. Does this matter? A 2010 survey conducted for Naomi Schaefer Riley's `Til Faith Do Us Part (Oxford University Press, 2013) estimates that 29% of married couples where both spouses are Catholic experience a divorce. The General Social Survey and CARA's Catholic Polls (CCP) indicate that about seven in ten married Catholics have a Catholic spouse (remaining steadily between 68% to 72% since the 1970s). This remains the case in the GSS even when one is measuring the faith of the spouse at age 16 (to control for possible conversions to a partner's faith during marriage). As we've shown in a previous post, the likelihood that a Catholic marries someone of their own faith in a Catholic parish is largely dependent on factors in their community. 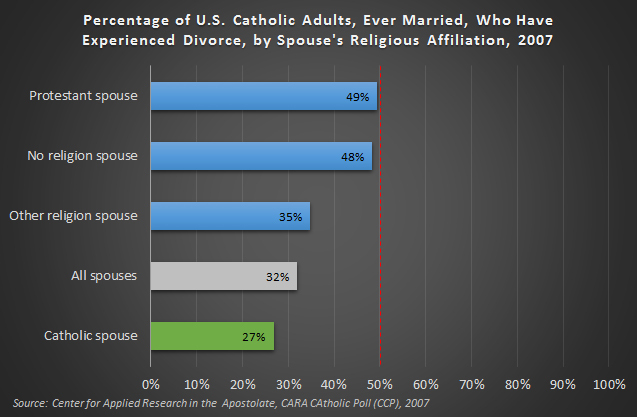 As shown in the figure below, calculated from a national CARA survey on marriage conducted in 2007, Catholics who marry someone who has no religious affiliation or a Protestant affiliation are more likely than those marrying a Catholic or someone of another affiliation to experience divorce with this person. Note this CARA survey estimates that 32% of ever-married Catholics had experienced divorce compared to the more recent GSS estimate of 28%. This difference is within margins of error. Schaefer Riley's survey, with fewer Catholic respondents, estimates lower odds of divorce for Catholics married to someone without a religious affiliation (...CARA's survey uses scientific probability-based random sampling. Schaefer Riley's survey was completed with YouGov, which uses a self-selected opt-in internet panel). In the CARA survey we also asked Catholics who had experienced divorce if they had ever sought an annulment. Only 15% indicated that they had. 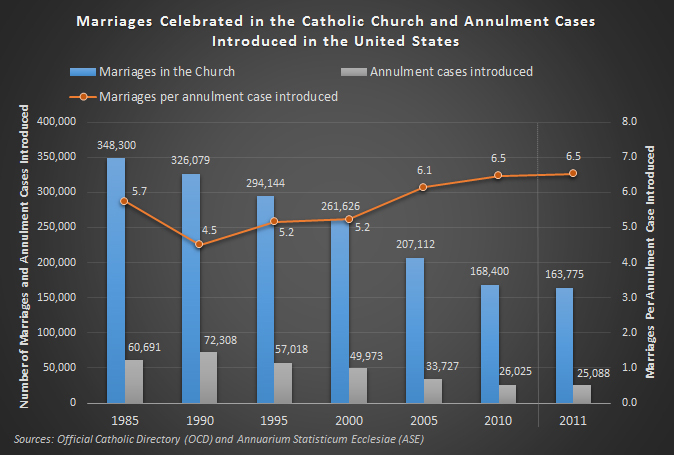 As shown in the figure below, requests for annulments have declined in the United States along with marriages in the Church. In the most recent year with available data there were 6.5 marriages celebrated in the Church for every single case for declaration of nullity of marriage introduced by Americans. It is important to note that 49% of Church annulment cases introduced globally in 2011 were from the United States followed by Poland (6.4%), Brazil (5.6%), and Italy (5.1%). The National Vital Statistics System estimates that there were 2,118,000 marriages celebrated in the United States in 2011. That puts the 2011 data in the figure above in grim context. Only 163,775 marriages were celebrated in U.S. Catholic churches in that year. That's just 7.7% of all marriages celebrated in the country. Catholics make up nearly a quarter of the population and are no less likely to marry than those of other affiliations. This means that Catholics marrying these days are just as likely, if not more likely, to celebrate their marriages at the beach or country club than in their parish (...also something we've covered in a previous post). What impact does being married outside of the Church have on divorce odds? We don't know. We need another survey! 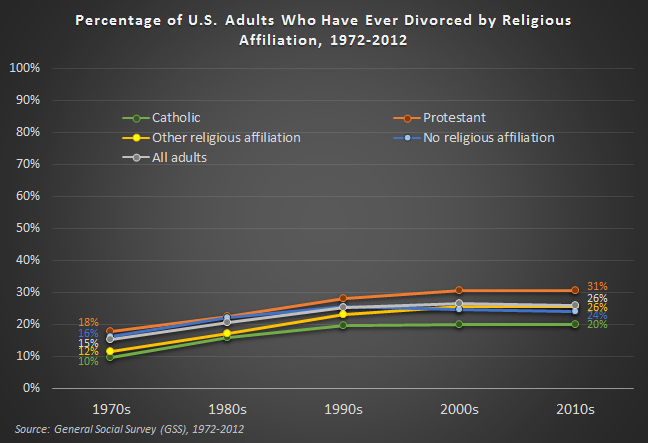 Although the Catholic "divorce rate" is lower than the U.S. average it is still a daunting figure (...yet far shy from the oft quoted "half of all marriages" myth). It is important to remember that the percentage represents more than 11 million individuals. Some are likely in need of more outreach and ongoing ministry from the Church. Image above courtesy of jasoneppink at Flickr Creative Commons.